In Uganda, only one out of every four girls make it past the tenth grade. Once out of school, girls are at high risk of HIV infection, violence, early marriage, or pregnancy. That’s why World Vision’s Strengthening School Community Accountability for Girls Education (SAGE) project in Uganda is working to reduce secondary school dropout among girls ages 13-19 in 151 schools in 10 districts. The project uses a two-pronged strategy of an Early Warning System (EWS) and Stay in School Committees (SISC) to transform social norms and practices; reduce risks of early marriage, pregnancy, gender-based violence, and HIV infection; and support girls to stay in school. While she was at home, Ejang worked hard to support herself, baking bread and selling it in local markets and gardening. Ejang’s sister, brothers, stepbrother, and stepsister had all dropped out of secondary school and married young. She worried that if she could not go back to school, her life would follow a similar path. After several months of absences, Ejang’s friends at St. Katherine’s school met with the head teacher to see if they could bring her back. Since Ejang was at the top of her class, she was eligible to receive a scholarship to fund her school fees. As part of the SAGE project, members of the Stay in School Committee came to her home and met with her mother. Ejang returned to school without books or pens, but with an eagerness to learn and succeed. Since coming back to school, she’s become more confident. 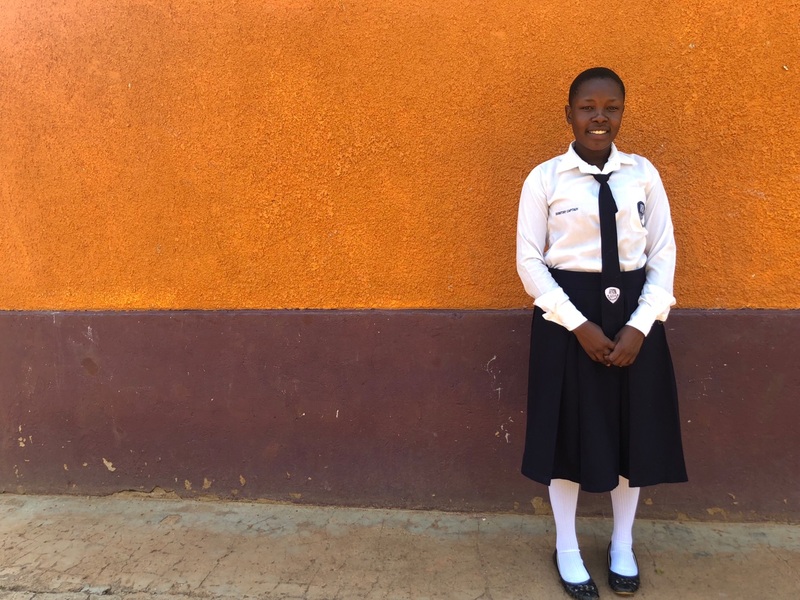 Her classmates elected her as a peer educator and she now counsels other girls about HIV prevention and how to stay safe, and even teaches them to make their own menstrual hygiene products, reducing some of the risks of dropping out. When Ejang was at home, she was vulnerable to harassment and violence while working in the village and in people’s gardens. She suffered emotional trauma from stressful family dynamics. At school, her teachers and peers are committed to helping her heal and are continually inspired by her motivation and dedication to her studies. Her teacher, Rachel, says she’s an active participant in class and in extracurricular activities. She participates in music, dance, drama, and poetry. Inspired by her mentor and teacher, Rachel, Ejang dreams of one day going to university to pursue a degree in economics and finance. Now 19, Ejang hopes to be an accountant and be able to take care of her mother and siblings. Nearly all the girls (95%) identified by the Early Warning System as being at “high risk” of dropping out were retained in school, including the 17 who had already dropped out and were returned to the school as a result of a home visit. Ejang is one of more than 38,000 girls supported by the World Vision SAGE DREAMS project in Uganda. She is a shining example of what it means to be determined, resilient, and empowered. Through the DREAMS project, girls like Ejang are able to see a new world of opportunity through education. Educated women have more skills, self-confidence, and are even likely to marry at a later age and have fewer children. At World Vision, we believe that every child is created in the image of God, with unique talents and abilities. Every child deserves the chance to experience life in all its fullness, to dream big dreams, and to realize their God-given potential. This program is made possible by PEPFAR and the U.S. State Department. Please email Congress today to ask them to prioritize girls’ education when making important decisions about foreign assistance funding this year. Photo: Ejang stands outside St. Katherine’s School in Uganda.